I love cemeteries. If you made me choose only one part of an old city to see, I would have to hang out with the dead people. It’s not because I’m morbidly depressed or have some mysterious cult matters to attend to…I just find cemeteries to be some of the most peaceful, beautiful, and historically-rich spots. Is there a better way to connect with the past than to walk amoung the graves of those who lived it? 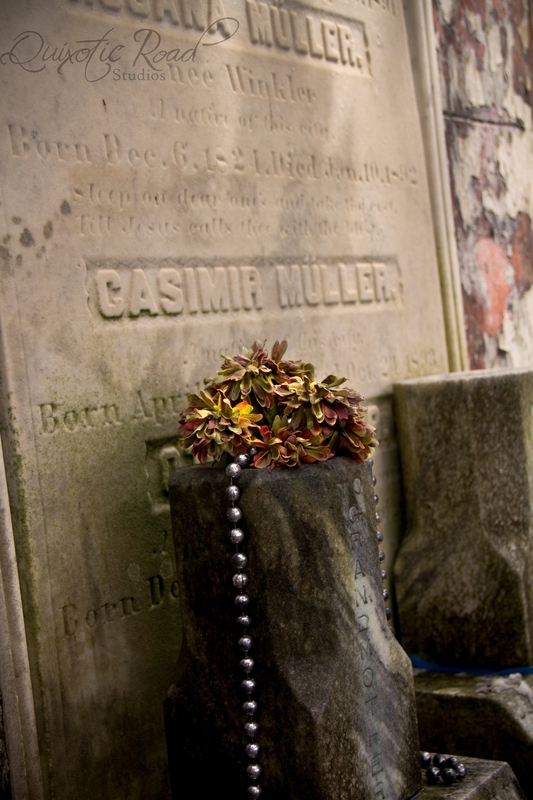 Heading down to New Orleans, I knew its famous cemeteries would be a must-see. The above-ground vaults and mausoleums that populate the city’s historic graveyards are often said to have been built in such a manner because settlers had trouble with the swamp earth pushing coffins up towards the surface. People would poke holes in the coffins so that during flooding, the coffin would just fill up and sink rather than rise. Another method was to fill the coffin with dirt before burying it. My favourite story was of a wealthy immigrant who brought jars of dirt from Europe when he came over. Once he died, his coffin was filled with the dirt so that he was literally buried in his homeland. However the truth about the above-ground construction is that they were simply built in French and Spanish styles, thanks to the extensive European roots of early immigrants. If you visited the famous Pere-Lachaise Cemetery in Paris, you would immediately be struck by the similarity. St. Louis Cemetery No#1 is the oldest and most famous cemetery still in existence in New Orleans. It is one block from the French Quarter and holds thousands of people, including, supposedly, Voodoo Queen, Marie Laveau. Thanks to constant thunderstorms and poor timing on my part though, I actually missed out on that one (but then I always like to save something for when I go back). If you visit, be aware that many of the cemeteries have very specific hours (generally closing around 2:30pm Mon-Sat and noon on Sundays). I did however, visit another of the city’s oldest cemeteries, Lafayette Cemetery No#1, nestled in the beautiful Garden District. 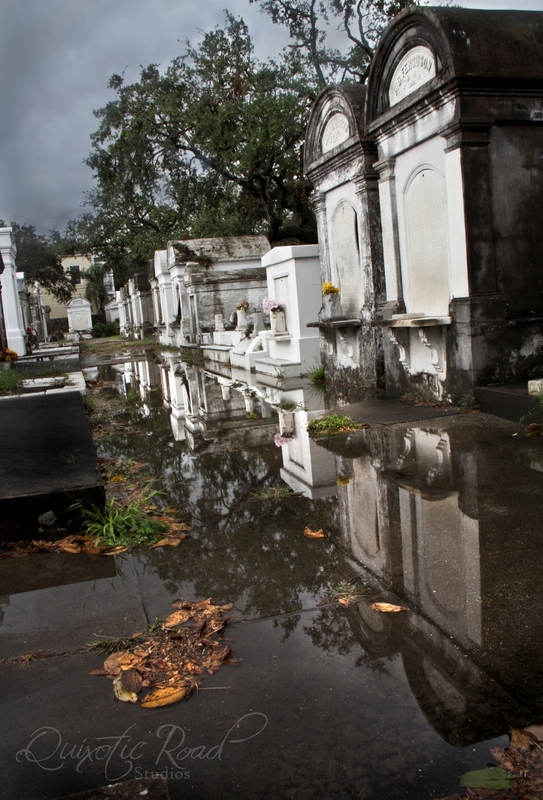 The Lafayette Cemetery holds more than 7,000 people in family and society crypts. In the mid 19th century, the yellow fever epidemic hit the area so bad that the cemetery was quickly filling up (7,849 people died in New Orleans in 1853 due to the disease). Thus the wide wall encompassing the graveyard has vaults built into it to hold the many bodies that were literally being piled up at the gates. This cemetery is one where you can feel the history oozing out of the bricks and ground (not literally though…thank god). Lafayette is not as well manicured or up kept as some of the other famous graveyards, which makes it, in my opinion, more interesting and more photogenic, with swamp ferns slowly reclaiming its crumbling stones. My travel companion and I accidentally stumbled across a free tour starting right outside the wall, so we tagged along. Usually I’m not a fan of tours, but when meandering around dilapidated tombs and the anonymous mansions of the Garden District, it’s nice to hear some of the history as you go. We went through the cemetery with our tour guide, as well as around the Garden District, before it started to downpour and madly thunder. But as is common with the weather in New Orleans, it abruptly changed its mind and the sun came out again. Knowing that after-rain light would be fantastic for shooting, we rushed back to the cemetery and took our time exploring the graves as we had the whole place almost to ourselves before it started raining again. The thunderstorm outside the walls of the cemetery. An old society crypt for the city's firemen. Similar to unions, there were societies that provided insurance to different groups. If you died, you could be buried in the crypt paid for by that society and they would even take care of your family for a time after. New Orleans cemeteries have a large grave robber problem. Many of the tombs' epitaph slabs have been broken apart in an effort to reach personal goods that may have been buried with the bodies. So how do they fit an entire family in one tomb? These vaults act as ovens for the bodies inside and increase the rate of decomposition tremendously. Common practice is to wait a year after placing one body inside before adding another one. Once the year is up, the grave would be re-opened and the remains, mostly bone and wood bits from the coffin would be all that was left. Those small remains might be swept to the back of the tomb or placed in a special burial bag inside the crypt and the new coffin would be loaded in. In the case of the time of yellow fever, when whole families were falling victim to the disease, bodies would be placed in temporary vaults, often in the cemetery walls, until their remains could be moved to the family tombs. If you would like to help support this historic cemetery and others like it in New Orleans, please visit Save our Cemeteries.